Eating out for lunch instead of brown-bagging it can cost three times as much, so eating out for 50 work weeks a year can add up fast. If you don't believe it, add it up with a lunch cost calculator. But leaving your lunch in a refrigerator at work can sometimes lead to thievery, leaving you without a lunch and $5 or more to go buy something. To combat sandwich thieves, designer Sherwood Forlee has come up with the Anti-Theft Lunch Bag. The clear sandwich bags have green splotches printed on both sides, simulating mold and making your fresh lunch look spoiled. 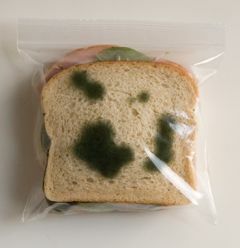 While sticky-fingered co-workers, roommates or bullies who take your kid's lunch will think twice before stealing the moldy looking sandwich, there's also the chance that they or someone else will throw the messy looking sandwich in the garbage. I guess that's the chance you take to prevent crime. The faux-moldy bags sell for $10 for 25 bags, and they're reusable. If you don't reuse them, it equates to 40 cents a bag to keep your lunch safe -- not a bad price to keep a hungry thief away from your sandwich. With some non-toxic paint or food dye you should be able to make your own bags. Now if Forlee could come up with a way to get people to remove their really rotten lunches from the office refrigerator and the moldy mess they create. Have you taken someone else's food from the office refrigerator?